Haha! Fortunately the spine one is just tucked under the plastic, and the others are just on the case, not the paper. TMNT The Hyperstone Heist for 25 usd. It looked CIB but the cover and label are re-printed ... fortunately the cart is original. All the lot for 125 usd. 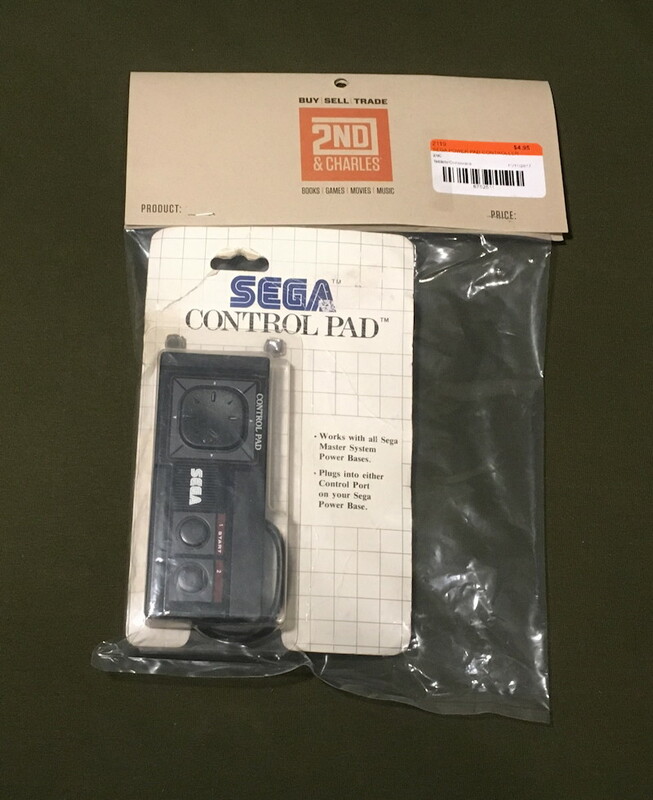 I found a battered but unopened Sega Master System controller for $4.95. I think I'll leave it in the 2nd & Charles plastic sleeve for an extra layer of protection. I picked up a loose Star Strike for the Atari 2600 the other day, I think that's the last M-Network game I needed (outside sports titles, which is no big deal since I won't ever collect them). Saw a Nintendo 64 with wrestling games at a yard sale for $80; didn't bother to ask. I sold Paper Mario for $42 (minus shipping) shortly after purchase. Since I'm thinking of it, I might as well mention that some months ago I was talking with someone who found a copy of Earthbound on SNES for $5 at a Goodwill and promptly sold it for a nice profit. It looks like deals are still around. Last edited by Slate; 07-19-2018 at 09:27 PM. Bought a 6 Foot Dreamcast Controller Extension Cable with its box for $0.50, passed on a few DS and Xbox 360 games. Over the past month or so, my wife has come home from garage sales with maybe 10 games or so. The ones I remember are Mario Kart Double Dash, Super Smash Bros Brawl, Super Monkey Ball 2, and Tomb Raider Angel of Darkness. The times I went out looking anywhere I haven't found anything. I think all I got when I went to a used games store recently was a Nyco Perfect Shot Wii gun shell for a couple bucks. I was walking by a garage sale on Saturday and stopped in. The guy saw my Star Wars T-shirt and asked if I liked star wars stuff, and offered to go look for some he thought he had. I said it probably wasn't worth it, I'm more interested in old video games. He didn't think he had anything like that, but went to find the SW stuff. Eventually came out with a N64 box and a N64 controller box. The system box had all the packaging and such, but mice had gotten in. Looked okay on the outside, and once upon a time I might have tried to salvage something, but I didn't object when he just chucked it in the garbage. The Controller box had a memory pak box in it and all that was in great shape. He let me have it, but I left him a quarter, the only cash I had on me. Lame story, sorry. It's not too lame, Cornelius. Heh. Total price was, at first, $15; however, the fellow also told me he was into fabricating things and he showed me a good Fallout 3 Shich Kebab he had made (minus the flame capabilities) and I commented "I wonder what you could make with a 50s Hoover Vacuum..." and he mentioned he had an Electrolux; I then mentioned I had a nice 50s/60s Electrolux and he was interested and bought it for $10 (I paid $12 - Edit - I previously thought I paid $13.) I also gave him a bottle of Blueberry Basil Kombucha (though I volunteered that to introduce him to Kombucha.) In total, this haul was $7.50. EDIT: I may have done better than I thought with the NGPC games. If Evolution were the PAL version I could have struck it rich. Last edited by Slate; 08-16-2018 at 03:28 PM. not a lot for this year. I don't bother with garage sales anymore because I never find video games; not even newer stuff like PS2 or Wii. Found a Wii with the cables, sensor bar, a controller and 2 of the smaller plug-in controllers with a few other things for $25. Passed on a DSI which was having issues; when I hit the L or R button, it got an error message. Last edited by Slate; 08-02-2018 at 10:24 PM. Last edited by Slate; 08-05-2018 at 11:06 PM. I'm starting to think (Edit: Possibly because of Cornelius' post about his Star Wars shirt and find) maybe I should go to yard sales wearing an Atari Tee Shirt and also start hitting Craigslist. It's Monday, I haven't found anything lately but I sold that broken Game Boy for $18.50 with free shipping. I saw the discussion of Goodwills and Salvation Army stores in the last page. I can't speak for what it's like lately outside my little part of Pennsylvania, we all know 2003-2006 or so was a golden time in yard sales (and I had a good finds in both stores then) but I'll keep the subject in mind for future replies. Last edited by Slate; 08-16-2018 at 03:32 PM. I'm going to stick these on eBay. At one yard sale, I saw a Playstation with some common games and a dusty NES (from the original owners) that they were asking $50 for. Keep in mind this is 2 weeks after buying an Atari 2600 for $3 from a man who might have been the original, 61 year old, owner. Some games are still around even if it's sparser and people seem to be holding on to games more lately. I might have not been vigilant enough to get there in time, wherever "there" might be. Last edited by Slate; 08-17-2018 at 05:26 PM. I haven't found squat in months. It's like washing your car and it almost inevitably rains the next day, breaking a dry spell. I totally get it. Good luck! I went to three different flea markets this weekend - one was such a bust that I was the second car in the entire parking lot - I did find some things. One was this group of Super Famicom carts, from a seller that always has baskets of them for $4.99 each. 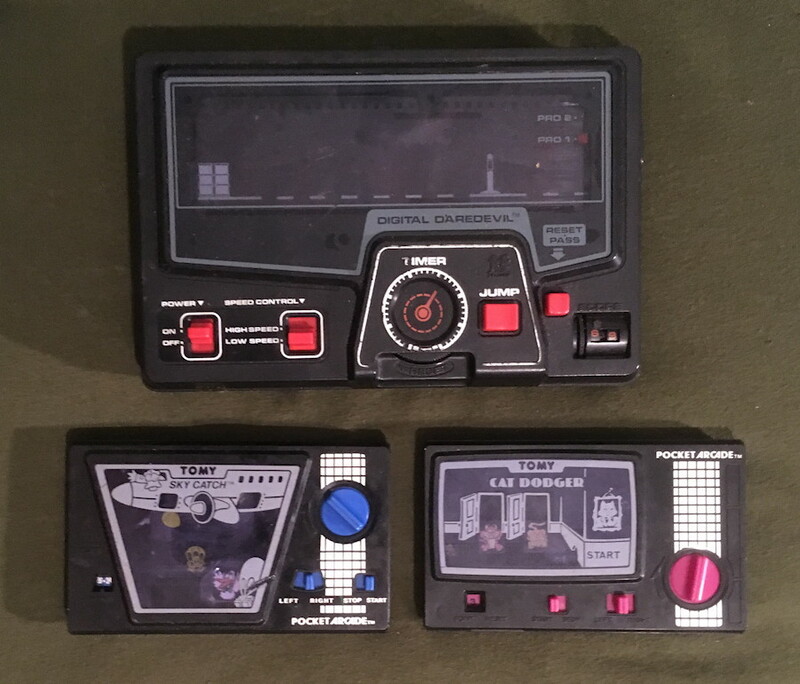 The second pic is a bunch of Tomy toys from the days before all these newfangled vidya games got so popular with the kids. $13 for the three of them. The two wind-up ones work, I haven't tried out the battery operated one yet. It seems having my wife go out to yard sales by herself works best for me, since I rarely find anything. This week she came back with a couple GameCube games and one of those giant cloth Legend of Zelda posters. Steve W, how often do we find imports in the wild? I can think of two instances for me, once being in this thread with the NGPC games; the other time is when I found a Virtual Boy, the stand, controller (with hard buttons from someone spilling soda into it; probably the reason why it was donated but it was easily fixed) and one baseball import for $3 at a Goodwill back in 2005 or 2006. Then again, I'm in rural Pennsylvania over 50 miles from Pittsburgh. I haven't found anything game related lately, it's all just a bunch of PS2 or PS3 generation games in the stores so I'm keeping my eye open for various games from those generations. 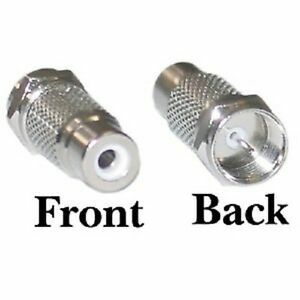 My Atari generation coaxial cable adapter arrived from eBay, however, and Father's finding non-gaming items to resell. I'm surprised I never bought one of these 12 years ago. Last edited by Slate; 08-21-2018 at 10:15 AM. Honestly, back in the late "aughts" I used to find imports all the freakin' time in the wild. Seriously, I've come across a couple Japanese Mega CD games (no discs in the case and the flea market vendor didn't speak English so I couldn't get any info where the discs went to), a Japanese Dreamcast (only realized that later because there was a blank cover instead of a modem), many European games for all sorts of consoles, and those are just the ones I've passed on. Nowadays I rarely ever go looking in the wild since there's no point but in the recent past I have bought a bunch of imports just because I know it's something I can't find normally (and especially if it's cheap). 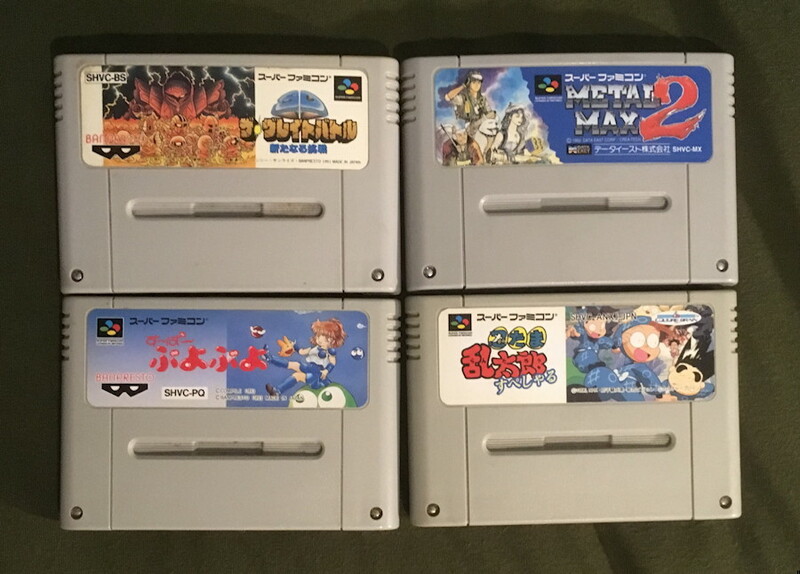 The Super Famicom games I bought down in Lafayette, Louisiana at a flea market but I generally find imports around Dallas. I'm always amazed when I come across any of these things. How did a boxed mouse for the Japanese NEC PC-88 line of computers end up in a flea market in Texas? It's only $4? I'll take it, just in case I come across a use for it. These things just seem to flow into this area, and I have no idea why. Do I need a PS1 that's UK only and has a SCART output? No, but it's pretty cool to own it and the games that were donated with it. Especially if they're being sold cheap. I did have to visit all four locations of this local thrift store chain just to find all the games and pieces of the system. A lot of stores around Dallas have imports, too. Most of the retro game stores have at least a few of them. When the PSP and Nintendo DS hit the market, a chain called Fry's Electronics fluffed out their shelves with Japanese imports for them. That was cool. It's shocklingly easy to come across imports in the Dallas/Fort Worth area. Huh. I suppose you have many more people interested in imports in your part of Texas than I do here. The second time I found imports, I only got them off a fellow from Arkansas who was moving out of his apartment. Paid $7 from a small thrift store. Last edited by Slate; 08-27-2018 at 02:31 PM. Nothing spectacular; everything here's loose. Plus tax. I bought these from The Exchange in Monroeville. Not really good enough to be considered a "find," IMHO; they're low priced commons. At least I have something that can use the power glove now, however. As a footnote, this is the first day I've seen CDI Games in person; I also saw a 3DO game, a Turbpografx-16, Lynx games and four different NES Power Sets all within 2 miles of each other. Nothing, however, was "in the wild." Edit / Update: I'm heading to a flea market tomorrow, the 25th. Maybe I'll find something at least lower than eBay pricing. Last edited by Slate; 08-24-2018 at 07:26 PM.